Clorox Healthcare Hydrogen Peroxide Cleaner Disinfectant from HealthyKin.com has the fastest non-bleach disinfecting times available. It does not have harsh chemical fumes or odors, and was designed for use on a broad range of healthcare surfaces. 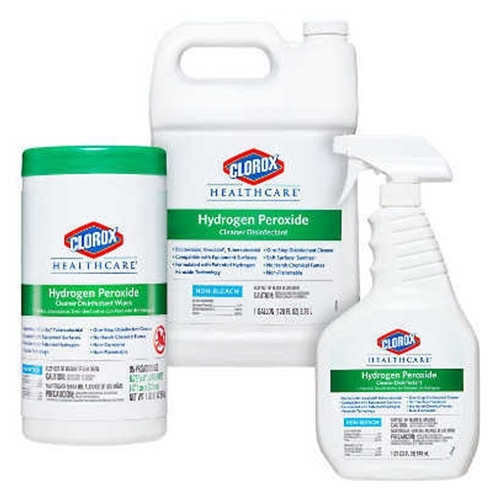 Clorox Healthcare Hydrogen Peroxide Cleaner Disinfectant can meet 38 bacteria and virus contact times with one wipe on a 4 square foot surface. I am thrilled to find a way to purchase these wipes as an individual! I have severe scent sensitivities causing asthma and other problems. These are great! There is absolutely no perfumed or chemical scent at all. The standard size wipes go a long way when used. The only down side at all is a slight residue left behind, but for all the cleaning power, germ killers and zero offensive smell, it is worth it. I work in the office of an elementary school. When our school RN researched and ordered these for our health room needs I was intrigued. After using them to clean up after kids in the office area, I was a believer! I plan on trying other products offered. My husband has lung issues so didnt want a clorine product! Then after my family came down with the norovirus (one by one) I feel like this product will help control future outbreaks in my home. - getting a lot of bang for the buck - but why are they so hard to find??? Glad to have found healthykin.com (i'm sharing)! So far so good... did a lot of research and this product got rave reviews across the board. I actually found video from a micro-biologist comparing various products and this was top. HealthyKin's service & price was also excellent! After my whole family got the Norovirus, I knew I needed something to prevent this in the future. How surprising that there are so few places to find this product! HealthyKin offers this product at a great price and the shipping was fast. I got both the wipes and the spray, and I like them both. Awesome product and wonderful customer service! Product is awesome look at the list of germs it destroys. There is a reason Doctors use it. But what was amazing was the service when I hit the enter button 12 hours later it was delivered.....WOW!!! Very satisfied with these wipes. Norvirus is scary, but felt confident after using them that we would not get sick. Highly recommend them. Excellent, and received so quickly--in time for our need. Great wipe for a great price. I bring these along with me wherever we go . They are one of the few that have been proven to kill Norovirus so I feel better after giving restaurant tables and shopping carts a quick wipe with these. They are over 3 times LESS expensive here than on my usual go-to shopping site.